The Czech Donald Trump: "I have stopped believing in multiculturalism." "I have stopped believing in multiculturalism." Andrej Babis, one of the Czech Republic's wealthiest people, presents himself as a non-ideological results-oriented reformer. He has pledged to run the country like a business after years of what he calls corrupt and inept management. He is demanding a return of sovereignty from the European Union and rejects the euro. Babis's anti-establishment party ANO (which stands for "Action of Dissatisfied Citizens" and is also the Czech word for "yes") is centrist, technocratic and pro-business. ANO, which rejects political labels, has attracted voters from both left and right, pulling support away from the established parties. "The West European politicians keep repeating that it is our duty to comply with what the immigrants want because of their human rights. But what about the human rights of the Germans or the Hungarians? Why should the British accept that the wealth which has been created by many generations of their ancestors, should be consumed by people... who are a security risk and whose desire it is not to integrate but to destroy European culture?" — Andrej Babis, candidate for prime minister of the Czech Republic. A "politically incorrect" billionaire businessman opposed to further EU integration is on track to become the next prime minister of the Czech Republic. Andrej Babis, a Slovak-born former finance minister who has been sharply critical of German Chancellor Angela Merkel's open-door migration policy, is leading the polls ahead of general elections, set for October 20. Babis, one of the country's wealthiest people, presents himself as a non-ideological results-oriented reformer. He has pledged to run the Czech Republic like a business after years of what he calls corrupt and inept management. He is demanding a return of sovereignty from the European Union and rejects the euro; he argues that it would "be another issue that Brussels would be meddling with." He has also said he plans to cut government spending, stop people from "being parasites" in the social welfare system, and fight for Czech interests abroad. Babis is often referred to as "the Czech Donald Trump." Babis's anti-establishment party ANO (which stands for "Action of Dissatisfied Citizens" and is also the Czech word for "yes") is centrist, technocratic and pro-business. ANO, which rejects political labels, has attracted voters from both left and right, pulling support away from the established parties. Babis has said that ANO aims to replace left and right with "common sense." "No euro. I don't want the euro. We don't want the euro here. Everybody knows it's bankrupt. It's about our sovereignty. I want the Czech koruna, and an independent central bank. I don't want another issue that Brussels would be meddling with." "In return for billions of euros, she should make sure that Greece and Turkey completely stop the arrival of refugees in Europe. Otherwise, it will be her fault what happens to the European population. Unfortunately, Mrs. Merkel refuses to see how serious the situation is in Germany and in other EU nations. Her attitude is really tragic." "Unfortunately, the migration policy is responsible for this dreadful act. It was she who let migrants enter Germany and the whole of Europe in uncontrolled waves, without papers, therefore without knowing who they really are. Germany is paying a high price for this policy. The solution is peace in Syria and the return of migrants to their homes. There is no place for them in Europe." "I will not accept refugee quotas for the Czech Republic. The situation has changed. We see how migrants react in Europe. There is a dictator in Turkey. We must react to the needs and fears of the citizens of our country. We must guarantee the security of Czech citizens. Even if we are punished by sanctions." "We have to fight for what our ancestors built here. If there will be more Muslims than Belgians in Brussels, that's their problem. I don't want that here. They won't be telling us who should live here." Babis has called on the EU to establish a system to sort economic migrants from legitimate asylum seekers: "The EU must say: You cannot come to us to be unemployed and immediately take social benefits." "We are not dutybound to accept anyone and we are not even now able to do so. Our primary responsibility is to make sure that our own citizens are safe. The Czech Republic has enough of its own problems, people living on the breadline, single mothers. The West European politicians keep repeating that it is our duty to comply with what the immigrants want because of their human rights. But what about the human rights of the Germans or the Hungarians? Why should the British accept that the wealth which has been created by many generations of their ancestors, should be consumed by people without any relationship to that country and its culture? People who are a security risk and whose desire it is not to integrate but to destroy European culture? "The public service media in some countries have been brainwashing people. They have been avoiding problems with the immigrants. Politicians have also been lying to their citizens. This has only increased tension between the indigenous population and the immigrants. It is not acceptable that Europeans should have fewer rights than immigrants. "Many of the Middle Eastern refugees are unusable in industry. Many of them are also basically illiterate and they only know two German politicians: Merkel and Hitler." Mr. Babis wrote, "The West European politicians keep repeating that it is our duty to comply with what the immigrants want because of their human rights. But what about the human rights of the Germans or the Hungarians? Why should the British accept that the wealth which has been created by many generations of their ancestors, should be consumed by people without any relationship to that country and its culture? People who are a security risk and whose desire it is not to integrate but to destroy European culture?" It seems to me that the clarity, the vigor, and above all the bracing insights into the confusing and self-contradictory policies of the EU, will add more light and more honesty to the dialog that is taking place there. How long will it take for those who are silent, though anxious about the growing anxiety, to speak up and support the useful and protective ideas of Babis? If he's going to run government like a business, it should be as an insurance company. Government, (best conceived of by Albert Einstein as the largest collectively-owned insurance company) is a great idea if and when it doesn't compete with (much less pre-empt) private enterprise; it's OK for the government to buy food to feed the poor, but not to demand that only it is qualified to regulate food growing everywhere, much less to restrict and deny private individuals from growing or stockpiling their own food. Same goes for defending every other need: government can defend the country, but not restrict the citizens' rights to also own and bear their own arms to defend them selves; government can and should enhance private defense, but never replace it! People have rights to freely associate and form insurance companies, and to restrict others within their own properties to, say, buy insurance while therein. Our only real right is to not be attacked first, and our only real responsibility is to not attack others first. Beyond that, we need government to counter-attack second, because we have a right not to do so our selves, otherwise we would be enslaved to the criminals' whims and schedules. As a collective whole, however, we do have a responsibility to counter-attack second (to hold trials and sentence punishments) if only because the chance of being caught is more of a deterrent than fear of the amount of stated prescribed punishment. So as usual we have an individual right, but really only a collective responsibility, to defensively counter-attack. Government, in giving away our money to "foreign aid" is failing in its main duty to be our insurance company. And ditto by being able to borrow money from banks. Just as when the real, lesser insurance companies were illegally permitted to be owned by banks, by the bank-bribed politicians (that's a massive interest conflict, because insurance companies try to keep rates down by reducing risks and refusing to insure risky people, while banks actually profit most from issuing reconstruction loans for destruction-caused disasters and crimes)! 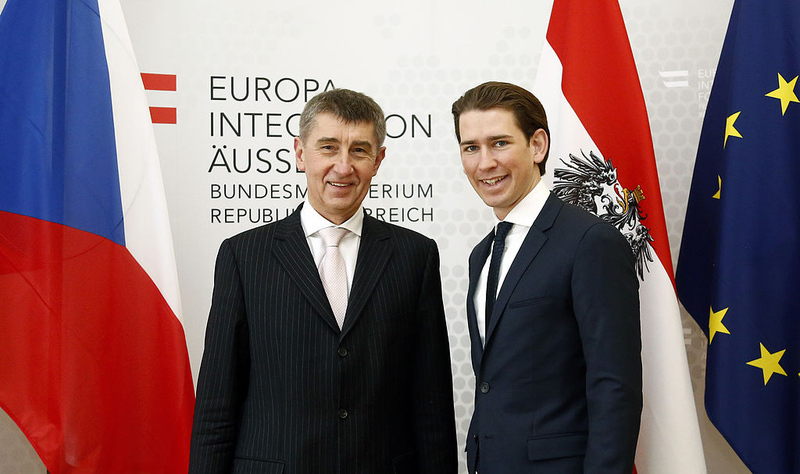 Mr Babis is right to point out the fact it is the Syria and other home countries that are the right place for the Middle Eastern migrants flooding Europe and that he calls for establishing peace there. But my question is, who created the tumults of war in these countries? US in the lead with countries in NATO alliance. The US and Europe for decades are supporting the Muslim fanatics in Saudi that are pouring billions of dollars to export their toxic Sunni Islamic ideologies and culture to other Muslim majority countries. For the meddling of Muslim fanatic but powerful rulers in the Midlle East Muslim majority but largely secular countries like Bangladesh and Indonesia are now full with ultra conservative values. The flooding of Hijab in these countries that started not before three or four decades is clearly a political statement and not a merely cultural change. As long as the US and Europe underpin a secular ideology and get themselves to support secular communities in the world, it will be very difficult for the European culture to survive. It is because secularism and pursuit of clear scientific knowledge are what European culture is based for last several hundred years. The whole world while contributed to developing this knowledge trove while borrowed from it too. Therefore, it is not only the interest of the Europe only, it is the interest of the secular forces in the rest of the world. But to make that possible the US-led west must take into account its grossly wrong strategy to back forces with fanatic religious ideologies and forge immediately a counter strategy. At the darkest hour, a true leader emerges. Reminds one of how New York was hopelessly lost and when leadership was needed, was in the ideological grip of fools like Mayor Dinkins and his police chief Brown. As the city spiraled into anarchy, and everything looked dark and hopeless, up stepped Rudi Giuliani. His speech to the Greek community of Flushing, Queens, made it clear he was the next mayor and a genuine leader. He unshackled everyone from the grip of pseudo Marxist rubbish pushed by the weak liberal elite and turned the city's fortunes and hope around. Of course, every blathering left opinion-maker loathed him, but he mysteriously kept winning. I asked a friend how this could be, and she replied that these people might sound like fools but they valued their lives more than their ideology, so they voted for him in the privacy of the polling booth. May Andrej Babis achieve even greater success. This guy is DEAD ON. The Stupidity of Germany, France, Belgium, ect is embarrassing and dangerous. Mr. Babis is the only sane voice and lucid mind emerging out of Europe at present. I wish him success in the coming Czech election. If he is successful, it might just stir others in Europe to consciousness and a conscience. Why would sane people relinquish their sovereignty to submit themselves and their countries to the dictatorship of the EU! Hitler failed to conquer Europe and eradicate the Jews. Frau Merkel is attempting to complete what he failed to do, by surreptitiously manipulating people through the EU to allow dubious Muslim 'refugees' to flood Europe. She knows Islam will eventually kill all the Jews, and Christians. The crocodile will eventually eat her too . (Apologies to Mr. Churchill). There are only a handful of Eastern European countries that realize that their nation and culture are at risk of being destroyed. Poland and the Czech Republic are two of those countries. They are realists who remember the loss of freedom brought about by the occupation of Nazi Germany and Soviet Russia. They are doing whatever is necessary to protect their freedom and nation. They are determined to succeed. Yes - the experience of Munich 1938, occupation by Nazis during WWII, the communist mayhem 1948-1989: all these are written in the Czech collective DNA. As a Czech by birth I am following the Czech mass media day by day. The populace is 90%+ for Trump and supporting anti-EU stance and yuugely politically incorrect at that. As V. Orban said the other day (paraphrasing his exact words): "In the 1990s, we looked up to the West. Now we are the (only) West". President Trump's speech during his Poland visit was directed not only to the Polish people but to the people of the Czech Republic and the other Eastern European countries that are now standing up for the survival of western civilization. He is trying to get the United States back into a leadership position so that we, as in the 1990's, may help preserve western civilization along with these brave few nations. Babis will certainly be better for the Czechs than any of the leftist parties, but in the sense of being non-political and non-ideological he's too much like Trump. Trump's major failing as a president is that nearly everything that goes on in government is political and ideological, and that he often fails to recognize the political-ideological components of what's happening, why it's happening, or the motivations of the people he's dealing with. Government is not a business, and it can't be run like one -- common sense, practicality, or what's good for the country, rarely have much to do with politics and government. A leadership position in government requires both a thorough understanding of the policies and principles that motivate your opposition, and principles of your own to keep you pointed toward a specific goal -- without this sort of understanding, a leader will make many bad decisions regarding personnel and policy, as Trump already has. Trying to do what seems to be common sense, practical, in the best interest of the country, or financially responsible, is not enough without understanding the political-ideological motivation of those opposed to such actions -- and being able to identify such people to know who your enemies are. Babis is rightly against the euro, but for the wrong reasons. He fails to see the political reason for its existence, which is to entangle member states until it becomes nearly impossible to get away from it, and then take control of them financially by the common economic policy that is already being promoted by Brussels. He wrongly believes that the EU is good because it gives money to the Czech Republic, without considering the loss of sovereignty entailed in submitting to EU treaties, laws, rules, standards, courts, etc., and their eventual political goal of usurping all power from member states and incorporating them into a single state ruled by the Brussels bureaucracy. Both Babis and Trump mean well, but neither will accomplish very much of what they intend without developing a much deeper understanding of the political ideologies of those they are dealing with, and adopting an ideology of their own to guide them. They can be expected to do some good things, and some bad things (because they don't understand who and what they're dealing with). Hopefully, they will learn on the job and make fewer stupid mistakes as they go along. Babis has yet to realize what the EU is, what motivates the people who run it, and that he won't be able to do the things he wants while remaining a member. Well, HURRAH! These are NOT the words of a man who should be described as Trump-ian! They are words that stand alone, and they belong to a man who seems much more intelligent than President Trump. Let us NOT now put a Trump-template on politicians who vaguely resemble our "Mr.Trump-Mess" ..(er! )...I mean, his royal Trump-ness! This man sounds good but let us ALL wait to see what he truly wants to accomplish IF he gets elected on October 20!!! I think his most endearing remarks are the ones that talk about protecting his citizens. Any nation must protect itself. That is WHY a nation desires and thusly acquired nationhood in the first place! To be forced to meld to foreign interests to the degree that Britain, France, and Germany have experienced with their present leadership at the helm, has proven to shutdown the spirit of each of those nations' citizenry. They are plowed under like so much refuse! I wish him well if he is elected and his word to his nation holds true! Multiculturalism IS and has always been a signed sealed DEATH WARRANT. At last. Someone in Europe has got it right. The EU parliament should have NO RIGHT to dictate a country's policies. Babis wants to protect the Czech republic form the hoards of Muslim pretend immigrants. He wants to protect the Czech culture. Those idiots and Merkel tops the list of politically correct politicians who are working their stupidity to the detriment of the native Europeans. Belgium and Sweden are two lost countries, over run with economic Muslim immigrants who feed on their welfare handouts without working, England Germany France Holland, Denmark, Austria, Spain, Ireland, Norway, Greece are being led down the garden path of ruination by their political correct politicians. The only solution as Babis has stated is peace in Syria and the Middle East and returning these Muslims to their home countries. Best news in years. It's a must. Time to stop the EU courts from bullying European countries. It's nothing more than a start to a One World Order. Globalization. Technocratic Oligarchy! Political correctness only works up to a certain point. After that, PC must be thrown out and replaced with common sense and logic. Without the latter, Europe, as well as other countries, is doomed. "Be as gentle as a lamb but as sly as a fox." - Old Testament. These words are common sense for all generations. What has happened to immigrants of old who worked hard to fulfill a dream of freedom and prosperity? They have been replaced with a new breed of immigrants with their hands extended out to take what has not been earned and with no intention of assimilation into the culture of their host country. Some European countries are guilty of promoting this new system. Kudos for Andrej Babis and those like him for refusing to allow their own countries to fall into the snake pit that Germany has willingly put herself. At first I thought that this was fiction! What a beam of light -- someone finally telling the truth. Just hope that the Czech people don't vote like the Germans or Dutch. Thanks Gatestone. The advantage of the countries that were behind the Iron Curtain before 1989 is that they were never really indoctrinated by this horrendously absurd political correctness. No political party has a chance for a any sort of widespread support in case they would advocate for the acceptation and distribution of "refugees". The Green party may attract maybe 2 pct. of the popular vote. It is generally accepted among the population that Islam, as a political ideology and a belief system, has no place in Czech Republic nor in any other secular / non Islamic country. And rightfully so. This man, Babis, is the first good news I've heard from Europe! They see clearly and obviously care about their citizens, along with Kurz from Austria and Geert Wilders from the Netherlands! I wish them luck and hope they succeed! This man really talks common sense. Thank G-D there are more and more people like him. There is yet hope for Europe. In Canada, we need someone like him to replace our ignorant, politically correct, Muslim vote pandering moron Prime Minister Justin Trudeau. Again, "Amen" to that, David. from a fellow Canadian. If you haven't already, please check out the website www.canadiancitizens.org. It is the web page of the "Canadians Citizens for Charter Rights and Freedoms". Davis, there is no real alternative to Trudeau liberals today. Conservatives led by their also feminist Andrew Sheer are practically the same repainted liver. We need an alternative party, which preserves what is left of Canada. That is telling it like it is. One voice for sense against the tsunami of stupidity in Europe. He has no chance to save Europe alone. Jews! Get out of this dangerous to Jews Europe. I am happy to read articles from this author Soeren Kern. I know that there is a care for the European people that I read between the lines. I would be happy to read further articles from Soeren Kern, as I will do after I finish this comment. I read the article on the "Czech Donald Trump" and it was good. I am hopeful for the future of Europe with new leaders that Soeren is writing about. I am glad that Austria, Czech, Hungary and Poland, etc, etc are resisting EU pressure to follow them over the cliff. As an American I am always looking for hopeful signs of European self-preservation. I look forward to more articles by Soeren Kern. God bless !! The Czech Trump. Way to go! Why don't more politicians in Europe revolt against the EU's suicidal intentions to give away their lands to Seventh Century throwbacks? I will never understand such stupidity! Some Europeans are finally starting to figure out what many regressive socialists in the west have yet to deduce, radical socialism has few solutions for creating a better world, redistributing wealth is a mere constipated myth in terms of achieving social justice. The secret is out, Muslims are not immigrating for reasons of personal need, they come as colonizers in the name of a Religion and too many of them reject assimilation out of hand, encouraged by by socialists false ideals. Islam is an element that must be considered when attempting to understand the depredations of the Ottoman Empire and the long term effects it has had in destroying the ME. Global warming, capitalism and Judeo-Christian values are not the cause of Islamic state stagnation. The first American foreign War necessitating the creation of the USN, was the war against the Jihad waged by Algeria, Libya, Morocco and Tunisia against western shipping. The Dey's demanded tribute by Christians be paid and enslaved our sailors. The expression likening going to work to, "going to the salt mines" was born of the Islamic treatment of slaves not that they treated their own citizens much better. Slavery and tribute were the basis of their economies. The war against the Dey's 5 point Jihad ebbed and flowed over 31 years until they were finally beaten. Paying tribute was synonymous with peace, peace is purchased, and in that part of the world still is. We should also remember that war fought 250 years ago by a USN largely Officered from men of the northern states included relatives of future abolitionists, it was witnessing the severe depredations of slavery imposed on Christians taken hostage, or prisoner in Jihadist shipping raids that roused questions about the American institution a too fact long neglected. The Czechs experienced first hand the depredations of the Nazis I doubt if the Islamist demands comparisons and contrasts are lost on them. Wow! Something for a change if all European leaders take cognizance of this absurd political correctness sacrificing the wealth created by their ancestors to these barbarians who rightly don't deserve considering the fact Europeans did not steal their wealth but what they robbed from others if at all it is correct. No one in the right mind will want to accept these refugees into their country and treat them as lords above their own citizens except for the stupid German Chancellor Angela Merkel. To the Czech people, go for it! Put this man in charge of your country. It is now down to Hungary, Poland and maybe yourselves that can stop this annihilation of western people, Western values and the western races by WESTERN GOVERNMENTS. You may even save the world. All hail, and shout the name of Andrej Babis from the rooftops! Yet another politician, who is, opposed to the methods used by the EU officialdom, threats, sanctions, or whatever new method they can use to put pressure on those who disagree with their crazy suicidal policies. We owe these "refugees" nothing! We are not obligated to aid them in any way! If the situation was reversed, we'd get no help at all from Muslims, particularly Saudi Arabia, and Qatar. They don't even offer aid to their own kind, other Muslims! Western politicians seem to possess some sort of guilt complex and by doing so, they miss the obvious, the fact that these "refugees", particularly Muslims, have no intention of integrating and instead want to replicate what they left behind them in the countries they were apparently escaping from! Merkel and Co have virtually delivered Europe into the hands of Muslims without so much as a whimper. But they tend to single out countries that oppose invasion, and label them Nazis. It has been missed by these do-gooder politicians that these Muslims are in fact a damn sight worse than any Nazi. The culture and ideology is totally alien to how we in the West live our lives. Our way of life is different, our values are at odds with Islam, and our attitudes towards females is completely different. We need more and more politicians such as Andrej Babis and a damn sight less of those like Angela Merkel! I sincerely hope that every European politician who is opposed to Muslims entering their countries stand firm and don't give in to any threats from Angela Merkel and her pack of Poodles in Brussels! We need more people of the status of Babis and Kurz uttering clearcut ideas to solve the deep troubles we're stuck since EU bureaucracy, Euro, migrants dominating our lives and jeopardizing our common wealth instead of cowardly complying to tyrannic cultural marxism called political correctness.